Marissa Meyer is from Tacoma, Washington which is the same city I live in. I think this pre-programmed me to enjoy Cinder, us Tacoma girls gotta stick together! 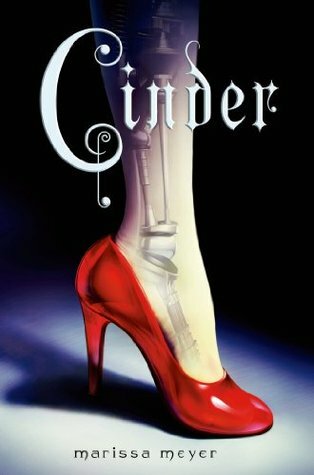 Cinder follows the story of a cyborg, named Cinder, in the city of New Beijing where there is a killer virus, evil lunar queen, and a swoony boy who happens to be a prince. See? It has everything you didn’t know you wanted to read about until now! Cinder surprised me with just how positive a heroine she was. She is a cyborg so many citizen in New Beijing are prejudiced against her. The man who adopted her died and left her with a terrible stepmother, and still she is hopeful about the future and willing to help those who treated her terribly. Cinder was selfless and I really liked that about her. Prince Kai was surprisingly down to Earth for being a prince. When I began this novel I expected him to be shallow and sheltered. Instead he was a prince of the people and I liked that he was willing to do anything to save New Beijing. The reason I wasn’t able to rate Cinder higher was because I wasn’t happy with the world building. It wasn’t bad it just wasn’t detailed enough for me. The society was explained at a superficial level but I never felt anything for it. In order for me to really enjoy a different world I need to care about it and I never found myself truly caring about New Beijing. Since this is a series though I expect more world building in the novels to come. Overall, Cinder was a fun mix of Cinderella meets Sailor Moon. I liked the premise and will definitely be reading Scarlet soon. I want to know what happens to Cinder, Prince Kai, and what role the Lunar’s will play in all of this. Cinder is now available as an audiobook for your listneing pleasure. You can check out an excerpt below on soundcloud from Macmillian Audio! This was on my shelf for well over a year before I finally got to it but I'm glad I did! It only gets better! Each following book I think is my favorite then I read the next one. I can see the lack of world building, there is a lot left to the imagination.